【上】为什么发明火药的中国人在公元1500年之前没有发明突击步枪（连发速射步枪） [美国媒体] Why didn't the Chinese, who invented gunpowder, have assault rifles by about 1500 AD? Why didn't the Chinese, who invented gunpowder, have assault rifles by about 1500 AD? That’s actually a fascinating question, which feeds into the larger question of why, given early Chinese advances, the European nations became technologically and politically dominant by the 1800’s. The theory I find most compelling (suggested by both Guns, Germs and Steel and The Rise and Fall of Great Powers) is that China had pretty clear and solid control over their region of the world, with no competitors capable of seriously challenging them. This lack of competition presented the danger of stagnation. There was no driving force to continually develop more advanced weapons (since they ones they had were good enough for their needs) and a single very conservative emperor could hold back both technological innovation and exploration for years. The short answer is that Europeans fought each other a lot more, and so had much more need of better guns with which to kill each other. I’m sorry, did you say “assault rifles”? Like a “rapid-fire, magazine-fed automatic rifle designed for infantry use?” And most of all, before 1500 AD? Oh my, I wasn’t even aware that any country had assault rifles in the 16th century. If by “assault rifles,” you really mean gunpowder weapons and early firearms (think fire lances, grenades, metal bombards, hand cannons, etc), then they had already been employed by the Song Chinese during the Jin–Song Wars in the Siege of De'an, which happened in the year 1132. You can read more about it on Wikipedia about Gunpowder artillery in the Song dynasty, Science and technology of the Song dynasty. Here’s a fun fact, the world’s oldest confirmed surviving firearm is believed to be the Heilongjiang hand cannon, although the Wuwei Bronze Cannon most likely predated it. Both of them are found in China. Early Ming military codes in the 14th century also wrote that 10% of all soldiers in the Ming dynasty should be gunners, and by the mid 16th century arquebuses were starting to become incorporated into the army. The Central Military Weapon Bureau increased the production of arquebuses shortly after they were proven effective in the battle against wokou pirates. 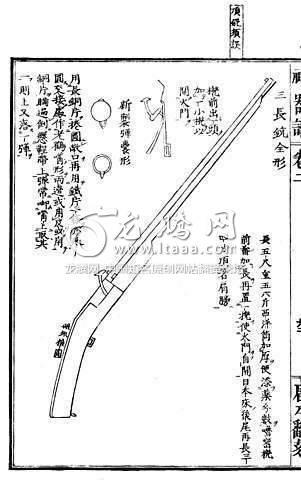 The design and use of arquebuses were very well documented by the Chinese. 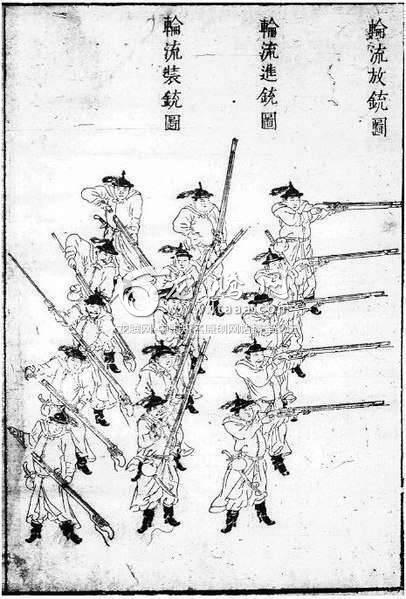 By 1548, Ming general Qi Jiguang had already applied the volley fire formation to arquebuses and wrote an entire manual called Jixiao Xinshu (紀效新書). There’s another book like this called Wubei Zhi (武備志), which was compiled in 1621 by officer Mao Yuanyi. And it’s not just China, by the way. Arquebuses were also used in 16th century Japan, Vietnam, and Korea (also, don’t forget Iran). It’s a myth that only Europeans had matchlocks in the 16th century. The Vietnamese were said to have produced the highest quality arquebuses at the time, which was documented by the Chinese. On the other hand, the Chinese thought that European arquebuses were not as good as Japanese and Ottoman matchlocks. The reliance on firearms might’ve actually been a major reason (among many others) that the combined forces of Ming China and Joseon Korea lost to the Jurchen cavalry in the Battle of Sarhū, a decisive battle that signified the turning point of the Qing conquest. 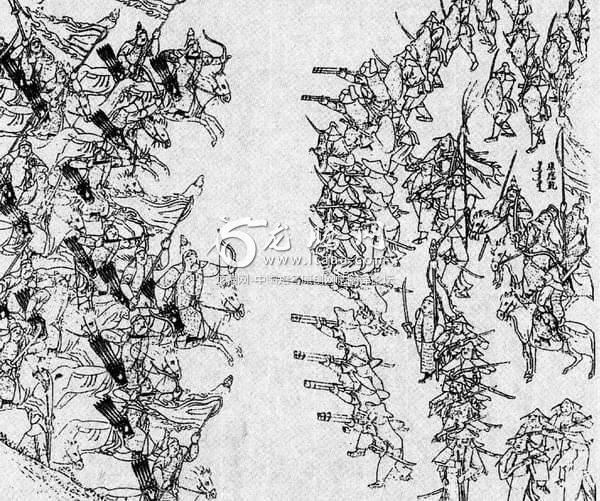 Jurchen cavalry charging Ming infantry in the Battle of Sarhū. Even after the Qing took over China, firearms were still being used and developed. However, the overall design remained largely the same as that in the late Ming dynasty, and archery actually held a higher prestige in the Qing dynasty as it was the national symbol of the Manchus. Zoom in on the puff of smoke. What do you see? Hmm, the weapons they’re using don’t look like swords and lances to me. Why nitrocellulose powder? Because guncotton is also known as smokeless powder. Its combustion products are mainly soot, carbon dioxide, water vapour and other small molecular weight gases. It does not form salts and other solid inorganic compounds as blackpowder does and which need to be cleansed off the barrel before each shot. If you attempted to build a rapid fire weapon on blackpowder, it would foul after the ten or so first shots, and then malfunction - perhaps even detonating and bursting the barrel. Smokeless powder is much cleaner and neater stuff than blackpowder. Why primer? Because you have to fire the cartridge as well. You simply cannot use a flintlock, matchlock, serpentine lock or other primitive means of firing on a rapid fire weapon. They are far too unreliable for that. See Required Secondary Powers - TV Tropes. The required secondary powers - in this case guncotton, machine tooling and primers - are the impediments why you could not build an assault rifle by 1500. They had to be invented first. But once they existed, the first machine gun - the Gatling - was only a matter of time.